When it comes to comedy, I like to think I know what I’m doing. MOREVI: The Chronicles of Rafe & Askana, amidst its swashbuckling action and romance, indulged in some well-needed comedic scenes. 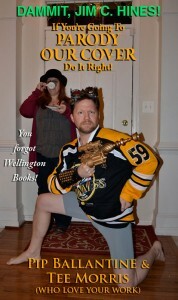 The Case of the Singing Sword is my homage to mystery noir and epic fantasy, and takes great joy poking fun at both. The Ministry of Peculiar Occurrences offers up intrigue, twisted tales, and cliffhanging moments. There are also moments of whimsy that steampunk allows. And before my life in between a book cover, I was treading the boards bringing to life comedy from Christopher Durang and William Shakespeare and making laughs up as I went with the good people at ComedySportz. So yeah, I know a thing or two about comedy. This is why I was a little disappointed and somewhat troubled by the early reviews of The Orville, a new science fiction comedy from Seth McFarlane. When the trailer dropped, the hype was the The Orville looked more like Star Trek than Star Trek’s upcoming Discovery. However, reviews from both critics and fans were less that praiseworthy. But comedy, even for someone like Seth McFarlane—and the humor he’s known for—is hard, and I can see why The Orville rubbed so many the wrong way: the opening scene. The Orville begins with the setting through skyscape after skyscape of a futuristic New York City. The camera follows a single craft carrying Seth McFarlane. He appears to be coming off a busy day at the office when he hears giggling coming from his bedroom. McFarlane opens to door to find Adrianne Palicki in bed with a blue alien…who apparently climaxes through pores in his head. There’s a quick exchange of “No’s” and “Let me explain…” but McFarlane ends the argument with “I’m done.” and then he sits in his shuttlecraft forlorn. Not really sure what McFarlane and director Jon Farveau were thinking but we could have done without that for an opening. It casts Palicki as a serial cheater and makes McFarlane look a bit like a sap. We know nothing about these characters in their situation, their motivations, or what direction we are headed with either one of them. That may be asking a lot from one scene, and an opening scene, of a new series, but that is what an opening scene does: it sets a tone. The Orville, sadly, set the wrong one; which is a shame as the pilot “Old Wounds” really does come across as a heartfelt love letter to Star Trek. I’ve been thinking about what The Orville got wrong in their opening as, earlier that morning, I had just started Alan Tudyk’s Con Man. Not science fiction comedy, but most assuredly science fiction adjacent considering the subject matter: Tudyk plays Wray Nerely, an actor from a one-season wonder science fiction adventure, Spectrum. In this cult television sensation, Wray achieves modest fame as the battle cruiser’s pilot. 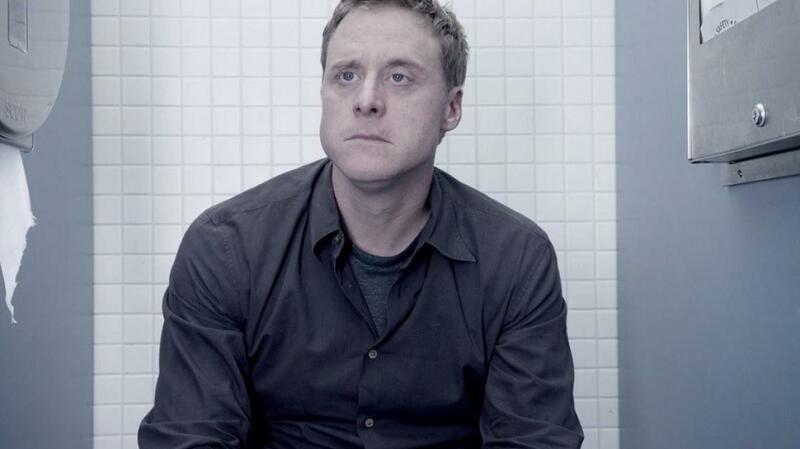 (Yep, Alan Tudyk does not shy away from anything in Con Man.) In-between B-level films and the odd voiceover gig, Wray is going from convention to convention meeting the fans and sharing his stories from the set of Spectrum. And he hates it. The opening scene for this show takes place across three bathroom stalls in an airport restroom. After settling into his stall, Wray calls his booking agent to complain about a miscommunication and reservation blunder in his flight. On the stall to his left, a fan recognizes him by his voice. The fan then slides into Tudyk’s stall a magazine to autograph. On the cover is Wray’s co-star and best buddy from Spectrum, actor Jack Moore (played by Nathan Fillion). Wray first begs not to sign the magazine as he is on the toilet, then claims he does not have a pen. Moments later, a pen from the neighboring stall is tossed into his. Then, from the stall to his right, its occupant starts up a conversation with the fan. In the middle of all this, Wray looks on the verge of a meltdown. 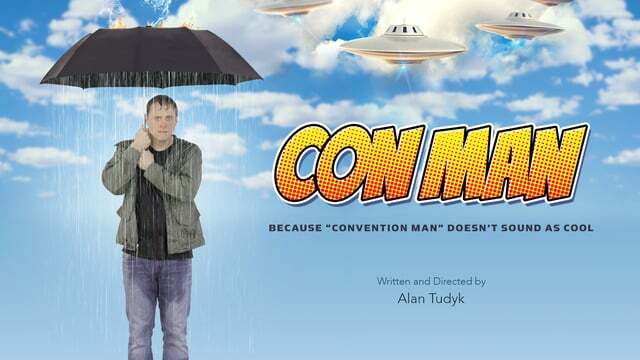 Where Con Man gets it right is the exceptional storytelling of that opening scene. Through setting and whip-smart dialogue, we are introduced to Wray and his miserable direction in life though his booking nightmare, an obnixious fan in the bathroom, and the magazine featuring Jack Moore. We also have the tone of Con Man which only builds on the misadventures of Wray as he stumbles from one terrible con experience to another. We also have names of those involved. We don’t have nameless caricatures moving through space. We have people that we get to know. The danger in getting comedy off the wrong foot is that recovery makes your job in being funny even harder, and The Orville had that to contend with, coupled with moments where the rough was especially thick and prickly. Scott Grimes’ Gordon Malloy might need to pull back the irreverence as his “plucky, quirky” demeanor seems a bit forced. The “ex-wife” jokes both in the pilot and in the second episode “Command Performance” also need to be spaced out. It’s low-hanging fruit. Amidst those missteps, though, are some comedic gems in this show. I had a good laugh over the “seat belts” moment. Truly a nod to a long-time running Trek fan joke. The scene that made me go “This is the show I was expecting…” was on the bridge between the Orville crew and the villainous Krill. Here, the “ex-wife/bad relationship” trope works brilliantly. You have to go over some pretty uneven road to get to this point, but it’s worthwhile for this scene. In the show’s following episode, Jeffrey Tambor and Holland Taylor make a guest appearance as McFarlane’s parents, and it’s delightful. The potential is tapped in these moments, and if McFarlane can continue to create magic like this, we could get the Galaxy Quest show we were all expecting. 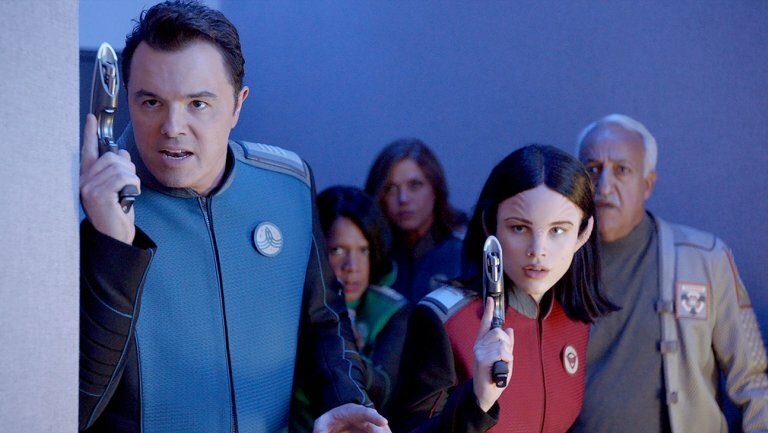 Regardless of the reviews and overall feedback of people in my Facebook feeds, I will give The Orville a shot because I knew this much about Seth McFarlane: He’s a geek of all kinds of fandoms. I dig that. 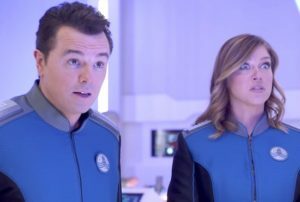 The Orville also looks like the best of both Star Trek and Galaxy Quest, and from the gems within the pilot, the teasers for the upcoming season, and the promise of cameos from Star Trek alumni, I believe McFarlane and The Orville could find its footing. Yeah, comedy is tough. Doesn’t matter where you do it or how you do it, nothing is more terrifying than these three words: Make me laugh. And when you’re trying to follow in the footsteps of James T. Kirk and Peter Quincy Taggart, comedy can look like Everest. I hope McFarlane and his crew are ready for this climb. I agree, I wasn’t impressed with the pilot episode. It was a terrible start. I was wondering if they were trying to make him look/feel like a pushover character. Because not only walking in on his wife, but his friend won’t listen to him with drinking while flying (until a close call). I thought he was set up to be weak as captain. I’m hoping this is so they can strengthen him as the show goes. The second episode was much better for me. The ex jokes do need to be placed at the right places with the right words. And here they used it well with the Krill, as you stated. I got a kick out of that scene, and the tree. I liked the Arbor day comment, especially with the follow up of all on deck and his ex-wife. It’s a light show in events, but could be heavy in jokes in references. I look forward to that. As does my kiddo too.